Since PAN is an important ID proof to conduct even the most basic of financial transactions, it is important that you are aware of these changes. The deadline for filing claims and objection in NRC ended on December 31, 2018. Election Guide 2019: How can I register as a voter? To get registered as a voter, you have to submit a filled in Form-6 to the Electoral Registration Officer (ERO) of your assembly constituency after which your name will be included in the electoral roll as a voter. 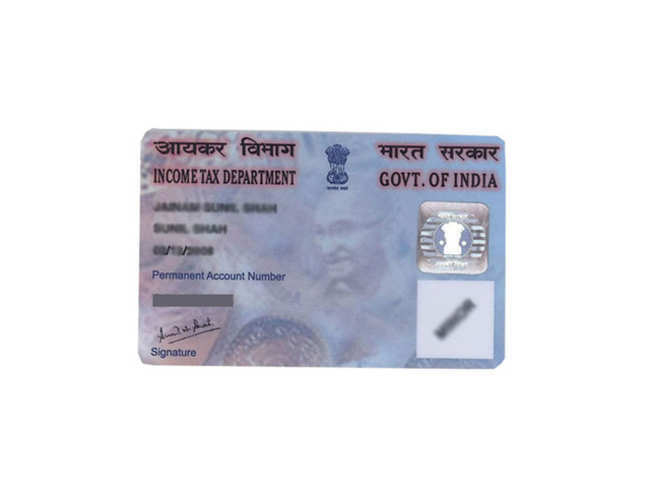 PAN card is a key document used for tax purposes and as a valid identity proof. The data recorded on PAN must be accurate and up-to-date. PM also asked CBDT to aim to shift to 100% technology driven mechanism for all the issues including e-assessment and sensitize its officers to increase efficiency and effectiveness. All India Gem and Jewellery Domestic Council also wants the PAN card limit to be raised to Rs 5 lakh from Rs 2 lakh. The BJP president aims to make India third-largest economy in 5 years, says there's no jobs crisis. On checking with the other bank, it emerged that someone had submitted a forged copy of his PAN card, with a different picture and a signature to get several loans sanctioned in his name. PAN is a 10-digit alphanumeric identity allotted by the income tax department which is required to conduct even the simplest of financial transactions. Here are some of the important tax changes directly impacting your personal finances that came into effect this year and the dates when they became effective. Currently, furnishing father's name is mandatory for the allotment of Permanent Account Number (PAN). An initiative of the civil aviation ministry and the Bureau of Civil Aviation Security (BCAS), the facility seeks to minimise paperwork for air travel under a digital system or e-boarding process for airport entry. As per Section 272B of the Income Tax Act, the income tax officer can levy a penalty of Rs 10,000 on you for having more than one PAN card. If you are looking to correct your PAN details, it can be done online as well as offline. Here's your primer on how to go about it. The government has rescinded notification that extended provisions of the Prevention of Money Laundering Act, 2002, (PMLA) to jewellery purchases. the Centre had contended that Aadhaar was made mandatory for allotment of PAN to weed out fake cards which were used for terror financing and circulation of black money. Can a US citizen invest in mutual funds in India? Yes, a US citizen can invest in mutual funds and other financial products such as NRI fixed deposits, stocks and more, subject to prescribed regulations. The five officially valid documents include the passport, driving licence, voter ID card, PAN card and job card issued by the NREGA. The panel was set up to look at various facets of household finance in India on the recommendations of the subcommittee of the Financial Stability and Development Council meeting last year. As per FM Jaitley, the savings through Aadhaar can fund three schemes of the size of Ayushman Bharat. Salaried individuals can save tax by paying rent to their parents and availing the HRA exemption benefit. Govt had defended the law, rejecting claims against it over privacy concerns and terming biometric identification as a vital feature of contemporary society. The Sebi has issued standardised norms for transfer of securities in physical mode. Millions of Indians could be facing the problem as the government insists on Aadhaar-PAN linking by July 31, a prerequisite to filing tax returns. Seven mobile phones, eight Aadhaar cards, one PAN card, a driving license and Rs 500 in Indian currency were recovered from their possession, police said. India announced on August 27 that it would allow operation of drones from December 1 and categorised them into five based on weight. Aadhaar-based e-KYC facility would allow individuals or entities wanting to apply for PAN to verify details such as date of birth or address by way of biometric identification. At present, furnishing of father's name is mandatory for the allotment of permanent account number (PAN). “When you are talking about mobile networking, you must focus on local content and local languages,” Union Minister Ravi Shankar Prasad said. Did you know how your PAN card number is generated? Officials explained that banning JMB is important as the outfit has opened its full-fledged India chapter, Jamaat-ul Mujahideen India (JMI) recently, under the leadership of Salahuddin Salehin and his deputy Jahidul Islam with three main objectives— proselytization, training and armed combat with a view to establishing Islamic rule across the Indian subcontinent. Thomas alleged that the Centre collecting personal data of citizens including the army and police personnel and handing them over to foreign agencies could well be termed “espionage or treason”. The SC order will have implications for linking Aadhaar to government welfare and financial inclusion schemes. The apex court said that it has come on record that 11.35 lakh duplicate or fraudulent PAN cards have been detected and out of these, 10.52 lakh cases pertain to individual assesses. India has always been a difficult place for premier brands plagued by constant policy interventions. Any deposit with a bank or a post office as well as opening of an account, other than Jan-Dhan, also requires the PAN card. The income tax data revealed that there were about 35.94 crore PAN alloted by end December 2017. The numbrer rose to 37.9 crore at March-end 2018. While the verdict made certain things very clear, there are still some questions left unanswered. Religious minorities from Pakistan staying in India on long-term visa could soon be issued Aadhaar/PAN cards and driving licence. According to notification issued dated April 9, 2018, Form 49A and Form 49AA, will now also have the option of transgender, along with the 'Male' and 'Female'. In an effort to address fears over surveillance, breach of privacy and data farming, the Centre is promoting offline verification tools for Aadhaar. Get to know the process of applying for a PAN by an NRI as they need to provide certain documents which are specific to them. The five steps listed here can make the process of taking a loan simpler and systematic. GJF has recommended GST at 1.25 per cent for the gems and jewellery sector, so that it help the industry become compliant and organised. "I am happy that Aadhaar Act has been upheld and private sector entities have been virtually barred from collecting or linking Aadhar to any services they provide," UIDAI CEO Ajay Bhushan Pandey said. A timeline of the Aadhaar scheme that was today declared constitutionally valid by the Supreme Court. The distribution of new-look PAN cards, being printed by NSDL and UTIITSL (UTI Infrastructure Technology and Services Ltd), started since January 1. ​​The state public service commission had invited application for over 10,000 LT grade teacher posts across the state. Rs 150-175 crore will be deployed to promote mutual funds investments. The matter is now being discussed at the highest levels in the government, considering the large-scale impact it can have on citizens if phones are disconnected in vast numbers. A Rs 2 lakh crore income declaration was made in the family's name under the IDS. But the government has rejected the claim and has stated that it will conduct investigations into the matter. If a bank account is opened by accepting Aadhaar without biometric or OTP authentication and other verification, then bank will be held responsible for any loss. The rule applies to all the bank accounts of an individual, though it is unclear how banks will capture the information of the cash deposited in other accounts. Once a minor PAN card holder turns 18, the relevant changes must be made in the PAN records as the card does not contain the minor’s photograph or signature. "We have shut our shops to protest against the mandatory PAN card requirement," All India Sarafa Bazar Association Vice President S K Jain said. The majority judgment still carries a confusion that has dogged the project through the years: is there such a thing as an "Aadhaar card" ? Subramaniam said,"with the festive season being strong in this second half compared to the first half, it gives us some hope for optimism. " The families, claimed they had been staying in apartments at Laxmi Niwas, Matunga, for around four decades and had been issued identity and address documents. The Bombay High Court has summoned three senior Central government officials to appear before it on January 8 to show what action had been taken in the matter. Gems and jewellery trade today expressed resentment over the requirement to produce PAN card for any transaction above Rs 2 lakh. Rajasthan has nearly 10,000 Atal Seva Kendras (earlier called Rajiv Gandhi Seva Kendras) at village panchayat and panchayat samiti levels which provide public utility services to rural people. Not meeting some of these could lead to substantial financial hardships. This brings me to my theory that horns are used by us purely to announce our presence in a sort of aural 'Kilroy was here' fashion. The I-T department, on April 10, amended income tax rules to allow transgenders be recognised as an independent category of applicants for obtaining a Permanent Account Number (PAN). With the imposition of the Swachh Bharat cess on all services from today, getting a new PAN card for income tax purposes has become costlier by a rupee to Rs 107. The commission's report, " Gambling and Sports Betting including Cricket in India", recommends a number of changes in the law for regulating betting and generating tax revenues from it. Forging PAN cards, voter identity cards, children’s birth certificates were different modes used by these people for their inclusion in the draft.